This behavioral economics podcast is another foundations episode where we discuss the E in NUDGES: expect error. I think this might be my favorite of all the types of nudges. This is really the reason we need nudges at all – and why choice architecture even exists. Choice architecture takes a lot of time, effort and strategy to do well and having a background in nudging is essential to helping your customers and employees make good choices. If we humans did not make errors, we would not need help in making decisions. We would be able to evaluate all the possible options and make an informed decision every time. Because we don’t and can’t…we need choice architecture. And it is all built on expecting those errors to properly build in nudges. In this episode, I talk about different types of errors with real life examples and how to apply this information to your life and business. [05:02] If humans didn’t make errors, then we wouldn’t need help making decisions. [05:16] We need choice architecture, because we don’t evaluate all of the possible options and make the most informed decision every time. [05:36] When it comes to errors – we can expect humans to err on nearly anything. No matter how brilliant someone is, they will still make errors throughout their lives. [06:01] Quote from Nudge: “Beethoven wrote his ninth symphony while he was deaf, yet he would frequently misplace his house keys. How can people be simultaneously so smart and so dumb?” This is what makes us human. [06:42] Errors come in many fashions – as I said it can be as simple as forgetting your keys or leaving the card in the ATM. These are actually part of a subcategory of error called postcompletion error. [06:57] Postcompletion errors occur whenever we have a task to do, and once it is partially done, we mentally check it off the to do list. [08:41] The list of potential errors is truly endless. [08:59] The dinging noise your car makes when you don’t have your seat belt on is a nudge, because manufacturers expect you to make an error at some point. [09:24] Check engine and filter lights are also nudges. [10:31] Try to incorporate all of the senses when creating a nudge. [10:52] Any time something is not consistent enough to become a habit (check out episodes 21 and 22 if you need a refresher) it is a prime candidate for error. [11:15] Consistency is key in business. [11:35] A good example of this is taking medicine every day at a consistent time. [13:06] Subscription models are really useful when an error is expected. They help the customer do what they are supposed to do, and it gives the business a built in reason to follow up and stay top-of-mind. [13:33] In the case of an air conditioning unit…it is important to have the ducts cleaned on a regular maintenance schedule. [14:16] I would recommend regular check ins with their customers – on more than just maintenance tips. That way, you can check in more than just once every three years (which is longer than you want to go if you want to remain top of mind). [15:24] People want heat when it is cold and AC when it is hot (this is availability bias – episode 15). [15:33] Send an annual check in or reminder in the fall and spring. The AC company could also create some type of certification program to prove that the unit has received recommended maintenance. This could help when selling a home and realtors could also be partners. [16:42] You get all this benefit from a little strategic foresight and understanding of when people will make errors, so you can step in and be the solution. [16:56] In any company, there are bound to be tons of places where people will make errors – both employees and customers. Dig deeper and look for more opportunities to solve errors before they happen. [18:28] Staff at the Ritz-Carlton have the ability to make things right for customers without having to ask for permission. 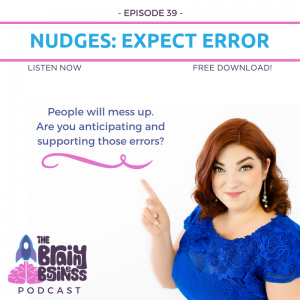 [20:06] When you are trying to anticipate errors to nudge, you should be looking all over the company – not just at customers, but employee processes as well. [21:39] Busy or overwhelmed brain, which we talked about in episode 32. This is where postcompletion error comes in. [22:21] Our conscious brain can only focus on so much and the subconscious is making the vast majority of our decisions using rules of thumb (as you know – this is the basis for behavioral economics). When we get busy, we become overwhelmed and have more errors than usual. [22:34] Things that aren’t habits are easily forgotten, but habits also get forgotten. Try to be present in the moment or nudge your team or employees to remember. [23:19] Too many nudges can become one more thing to not pay attention to. Try to get into the mindset of your customer or staff. [24:10] Things like auto-pay and subscriptions can be helpful nudges. [24:51] Stop trying to change the behavioral errors and force people into a system that doesn’t work. Instead look at what you can be adding into the process to make it easier. [26:15] Changing the nozzles for different drugs and anesthesia helped reduce common errors. Checklists in hospitals are also good reminders. [27:06] A busy brain and commonly repeated tasks are a breeding ground for errors. [28:37] Any time you say someone “should” be able to do this or “they know better” or if you have multitasking staffers…they are prime candidates for nudges. [29:09] Products to solve a problem. Customers are willing to pay for a solution to a problem that helps them avoid making an error. [32:59] Gmail has come up with some clever nudges such as asking if you have an attachment if you write the word “attachment” in the text of your message and there is nothing attached, and putting ignored emails back at the top of the inbox. [33:32] The next category involves understanding a hot state and a cold state. When someone is in a cold state, it is easy to say they will do something (or not do something) but then when they are in their hot state…it is a lot harder to stick to the commitment. [34:10] Find things that can be done in a cold state to prevent behaviors from happening in a hot state. [35:32] Programs like Save More Tomorrow have been used to increase the amount someone will pay into to their retirement using a precommitment. [36:30] Staying top-of-mind and why consistency is key in business. [37:13] It’s important to stay consistent with your business and have regular touch points with your potential customers. Put your customers in a drip campaign and send out your newsletter on a regular basis so it becomes part of their routine. [38:12] Remember, people make mistakes and it is your company’s job to find a way to make it easier for them to use your product or service. You cannot expect your customer to do that for you. [38:54] Follow your customers to see how they interact with the product provided. [39:59] Pourable laundry soap spouts are a result of observational research. [40:31] Look at your company or product for errors that take place and ways to place a nudge as a reminder.